A patio is a great space for catching a breath of fresh air from the comforts of your home. You can relax or spend time with family and friends, while lounging in your outdoor patio furniture or under patio umbrellas. You may even have a few furry friends who like to enjoy the space too. With all the traffic, your patio is bound to get dirty. Patio dirt can be hard and stubborn to remove because it gets constantly trampled on and engrained further into your patio floor. As well, plants like moss or mold can grow on the surface of your patio, making it slick and unsafe. A patio cleaner is a great way to remove any dirt, debris, or plant life that accumulates on your patio. It’s an affordable solution for any homeowner to keep their patio in pristine condition. It can be hard to choose a patio cleaner because of all the different brands and solutions available on the market. Our guide helps you determine the best patio cleaner for your patio floor, so that you can spend more time relaxing and less time cleaning. 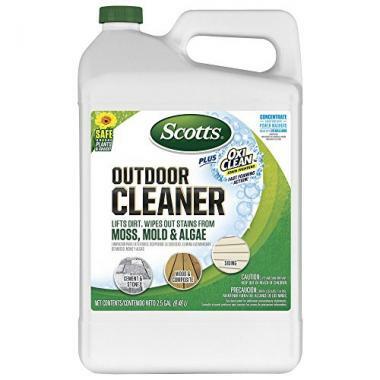 This top rated outdoor cleaner deep cleans stains from algae, mold, and mildew. It is fast acting with instant results. It works in just 30 seconds! The cleaning procedure is quick and easy. It can be sprayed on and hosed off. No pressure washing is required. As well, this solution is safe for your lawn and plants, when used as directed, because it breaks down once it is rinsed into the soil. It can be used on wood decks, concrete sidewalks, asphalt driveways, brick walls, lanais, stucco, stone, canvas awnings, plastic outdoor furniture, and more. Patio cleaner reviews love this outdoor cleaner calling it an “excellent product” and “really great stuff”. This outdoor cleaner is safe to use around plants, lawns, and fabrics. It works great on cement, stone, wood, wood composite, vinyl, brick, patio furniture, and other outdoor surfaces. It lifts the dirt and wipes out stains that are caused by mold, mildew, and algae. It contains no chlorine, bleach, or phosphates. 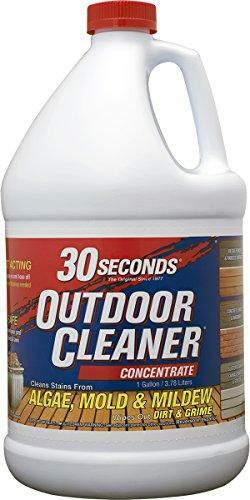 This powerful outdoor cleaner has a 3-step cleaning procedure that includes application, scrubbing, and rinsing. It will have your outdoor space shining and ready for your next get-together. This outdoor cleaner removes the toughest dirt, grease, and grime. It is one of the strongest cleaning solutions and has a “do-it-all” design for household or industrial needs. It is concentrated and can clean just about anything, anywhere. It can be used as a concrete cleaner or path cleaner and is environmentally friendly and proven safe. It is deemed non-toxic and non-hazardous, so that you can feel confident and safe when using this cleaner. This is a fast-acting cleaning solution that kills lichen, moss, and algae. It requires no pressure washing, rinsing, scrubbing, or hosing. The cleaning procedure is simple: you spray and walk away. It works on many different outdoor surfaces like roofs, sealed concrete, asphalt, and more. It is bleach and phosphate-free with a neutral pH. It can also improve the traction on many surfaces, as well as boost the appearance. This patio cleaner is better, faster, and stronger. It gives you a solution to everyday pet stains and odor problems. It is non-toxic, rapidly biodegradable, and environmentally friendly. It is free of harsh chemicals and safe for use on concrete, stone, artificial turf, terra cotta, outdoor furniture, and other outdoor surfaces. It has two powerful ingredients to eliminate dirt. The first, BioKore, is a plant-derived surfactant that breaks down and lifts away stains. The second is a molecular deodorizer that targets and eliminates odor molecules on contact. The solution will break down urine, permanently eliminate odors, and help prevent re-soiling. Skout’s Honor ensures their product is environmentally and socially conscious. This solution is safe for your pet, family, and home. This cleaning product is designed with masonry and concrete in mind. 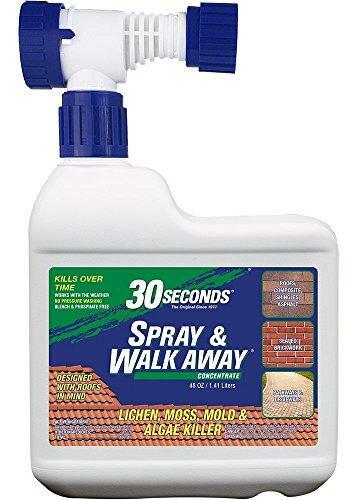 It is a safe and effective oxygenated bleach cleaner that can be used on concrete driveways, sidewalks, patios, garage floors, pavers, and more. It will clean dirt, grime, and stains that are caused by mold and mildew. It is non-toxic and safe for vegetation. The cleaner comes in a powder solution that can clean 900 square feet of space. The cleaning procedure is simple. You simply mix with water to make 6 gallons of cleaning solution. 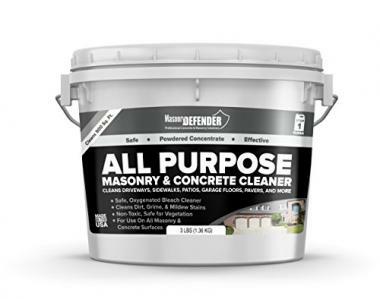 You can also use this solution to clean and prep masonry and concrete surfaces before applying other MasonryDefender products. This top rated outdoor cleaner will clean and restore all your concrete surfaces. There are a lot of different outdoor patio cleaners available with many claiming to be the best. It can be hard to determine which patio cleaner will truly get the job done efficiently and well. There are a few different features that you should consider before making a purchase. The best patio cleaner won’t contain abrasive chemicals, so that it is safe for use around children and animals. You’ll also have to decide which cleaner works for your patio floor and how it cleans. If you want a no fuss cleaner, look for one that can be applied and cleans without any scrubbing necessary. A top rated outdoor cleaner will have your patio looking better and staying cleaner longer. This is the most important factor when purchasing a patio cleaner. You will need to take into consideration the cleaning surface that you would like to apply the patio cleaner to. There are patio cleaners for limestone, concrete, block paving, and wood. You should be able to find a patio cleaner solution that is safe to use on your patio floor. It’s important to consider the material of the cleaning surface because different surfaces will react better or worse to different chemicals. For example, a patio cleaner that has bleach in it would damage a wood patio but may be safe for use on stone. If a patio cleaner contains sodium hydroxide, it is not safe for uncoated surfaces because the chemical is too strong. The best way to determine if a cleaner is safe for your cleaning surface is to look at the pH. You want the cleaner and the cleaning surface to have a compatible pH balance, which reduces the risk of damage. Each different cleaner for patio designs have different cleaning procedures. Some outdoor patio cleaners have immediate results and others take longer to work. You may find brands that require you to rinse your patio and others that can be applied and dry safely. If you see a path cleaner that is branded as “spray and leave”, you don’t have to scrub or remove the cleaner. The chemicals do the work and they are safe to leave to dry on your patio surface. It’s best to try and find a cleaner that will produce results that make you happy in the time you want. If you want minimal work, a spray and leave cleaner for patio designs would be best option for you. However, if your patio isn’t getting the clean glow that you want, try a different cleaning procedure to eliminate the dirt and grime. All patio cleaners should come with instructions that outline the cleaning procedure, so that you can determine if it is the cleaning solution that you want or desire, before you make a purchase. The area of coverage is the amount of space that your patio cleaner can cover. It will also depend on how dirty your cleaning surface is. Some patio cleaners have solutions that are denser than others. A dense solution will have a smaller area of coverage than a thinner solution. Some solutions come concentrated and can be diluted to clean the surface. If your cleaner can be diluted, it’s important that you following the accompanying instructions to ensure you’ve made a solution that can still tackle and remove the dirt. A solution that is diluted too much will be weak and may not deliver the results you want to achieve. As well, a patio cleaner than can be diluted, will often result in a larger area of coverage. On average, 5 liters of cleaning concentrate has an area of coverage of about 4,300 square feet. You should be aware of patio cleaners that contain abrasive substances or harsh chemicals. Some patio cleaning solutions, especially concrete cleaner solutions, with have acidic or caustic chemicals included in the solution. These types of cleaners are meant for deep cleaning and may damage some cleaning surface materials. 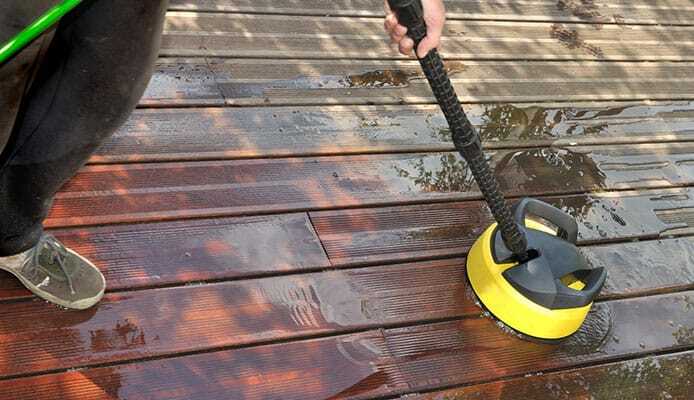 If you have a natural patio that is made of wood, you should not use abrasive substances, as you will likely cause permanent damage to your patio’s surface. You should also remember that a patio cleaner with abrasive substances or caustic chemicals is not a pet friendly patio cleaner. It should also not be used around children and the person applying the cleaner, also need to take measures to protect themselves from coming into contact with the cleaner. Most homeowners have an outdoor patio. Indoor patios are more commonly seen in restaurants and businesses. This means that homeowners should do their best to be environmentally and pet friendly with the cleaning substance that they apply to their patio. A patio is exposed to the outdoors, which means that any wild animal can easily pass through or across the patio. As well, cleaners will eventually dry and their evaporation goes into the air and further, the environment. 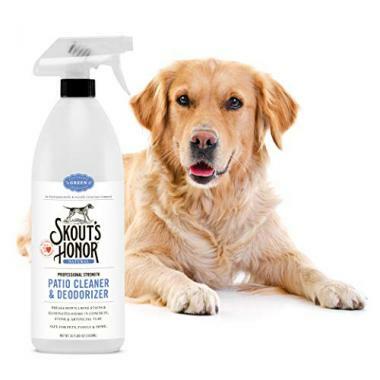 The best pet friendly patio cleaner will not cause any harm to animals and will be safe for the environment. You should be especially cautious about being environmentally friendly if a cleaner can run off your patio into your garden or plants. An environmentally safe cleaner won’t kill the plants in your garden or damage the soil underneath. A cleaner may be absorbed by more than just the cleaning surface, so to be a responsible homeowner you should consider where you cleaner may end up and how it may affect the environment around your home and yard. Q: What are the benefits of using a patio cleaner? A: A patio cleaner is the best solution you can use to clean your patio surface because it has been especially designed to remove the dirt, debris, and plant life that can accumulate over time. 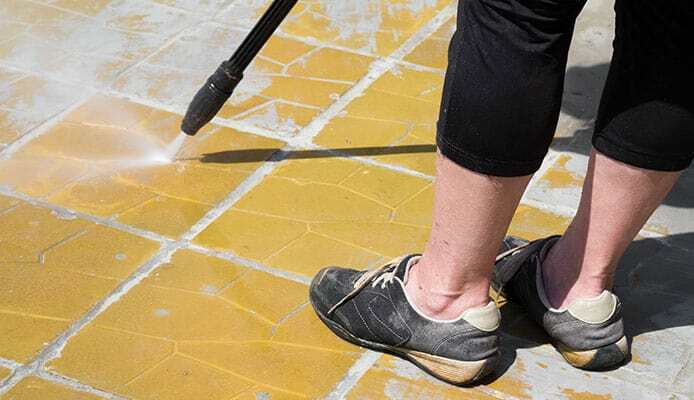 It can be hard to determine which cleaner is best for your patio surface and there are a lot of different patio cleaners that are deemed safe to use on different patio materials. A top rated outdoor cleaner will make your patio shine, all year long, without the risk of causing permanent damage. Even in winter, you should be able to relax with patio heaters on a clean patio surface. As well, there are lots of different options for the procedure and time it takes a cleaner to work its magic. The best outdoor cleaner will remove the hassle of cleaning from you, so that you can spend more time enjoying your patio. Q: How to properly use a patio cleaner? A: This can’t be answered in one straightforward sentence because there are so many different types of cleaners that all have different chemicals and procedures. It’s important that you follow the cleaning instructions provided with your patio cleaner. Every patio cleaner should come with specific instructions or directions for its unique cleaning procedure. However, the proper use of a patio cleaner would warrant that you always take precautions against coming into contact with the cleaning solution. Even if a cleaning solution is deemed safe for children or pets, that doesn’t mean that you still want to be allowing it to have a lot of direct contact with your skin. A proper procedure would have you use protective gear to ensure you aren’t risking harm to yourself. This is especially important with acid or caustic chemical-based solutions. 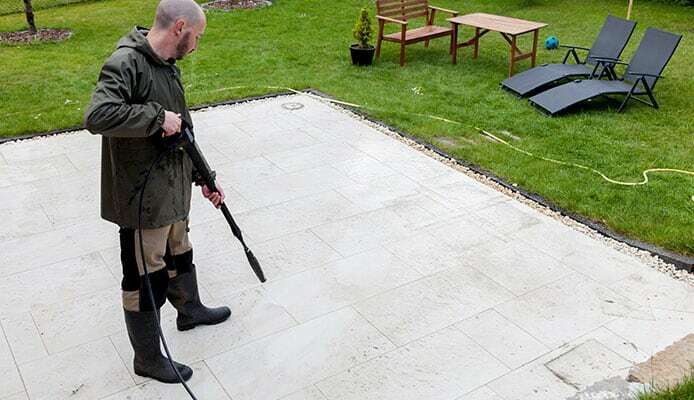 Q: Are there different types of patio cleaners for different types of stone and dirt? A: Yes. There are a lot of different types of patio cleaners that can be used on different surfaces. There are concrete cleaners, as well as cleaners that can be used for other stones, like limestone. Other cleaning solutions can be used on natural materials like wood. The solution of the cleaner and how it is used will also correlate to the dirt on your patio. The dirtier a patio, the denser the solution may need to be and the more time it may need to sit on the surface of your patio. Keep in mind that patio cleaners are designed with dirt and grime in mind. You should be able to find a solution for any type of surface and for any amount of dirt. A patio can become the pride and joy of your home. A patio is a great space where you and your guests can catch their breaths and relax. A dirty patio is an unattractive sight, but a cleaner for patio designs will keep your home looking pristine and new. One great way to find a great cleaner is to read the patio cleaner reviews. A cleaner with great reviews is likely going to do the job you want it to do with optimal results. By investing in the best outdoor cleaner, you can save time and money. Do you own one of the patio cleaners that made it onto our list? Let us know how it has served for your patio needs in the comments section below.